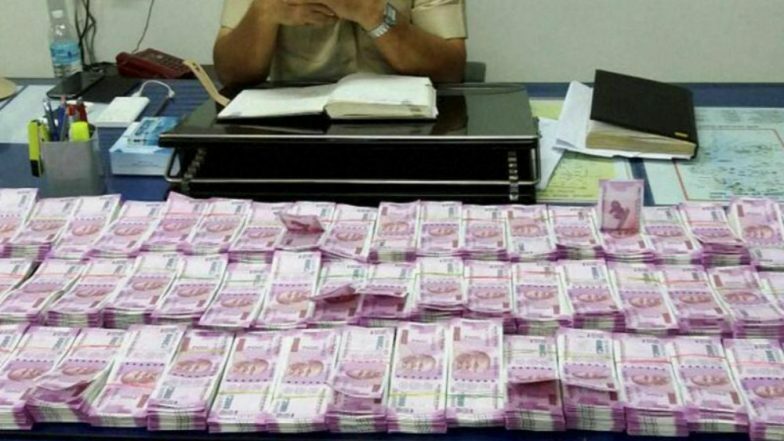 Chennai, April 15: The Income Tax (IT) department has for now concluded search operations in the premises of PSK Engineering after seizing about Rs 14.18 crore in cash, an IT official said on Monday. "Total cash seizure is Rs 14.18 crore and Rs 112 crore of unaccounted income has been admitted to," the official told IANS. Lok Sabha Elections 2019: FIR Against DMK’s Vellore Candidate in Connection With Income Tax Raids. The officials had on April 12 searched the premises of PSK Engineering in Chennai, Namakkal and Tirunelveli in Tamil Nadu to flush out cash apparently aimed at bribing voters. The company was into construction business. Several incriminating documents and accounts with details of generation of unaccounted money by inflating the expenditure, payments made to influential persons and unaccounted capital were also seized, said the official. In the operation carried out in the premises of one Sujai Reddy, evidences of investment of Rs 16 crore in a Malaysian company was found which was not disclosed in his IT returns, said the official. "Unaccounted cash of Rs 18 lakh was seized from Reddy's premises." Vellore Lok Sabha Elections to be Deferred? Suspense Brews After EC Seizes Cash From DMK Leader's Cement Godown. Meanwhile, the flying squads of the Election Commission searched the MLA hostel here on Sunday night after it got information of cash stocked in the hostel rooms for distribution to voters. The Lok Sabha polls in Tamil Nadu are slated for April 18.